The Starks are always right. Pumpkin-flavoured everything is coming. 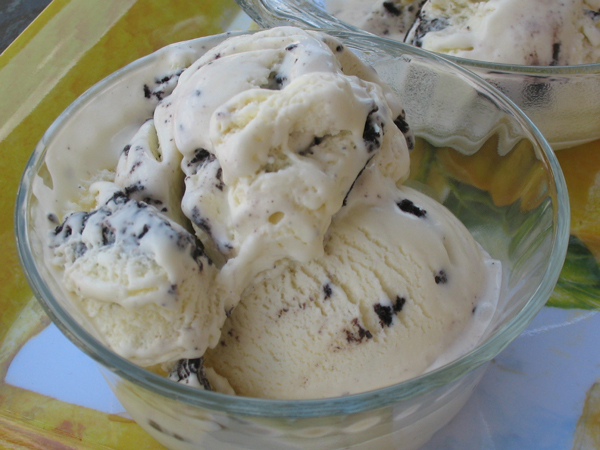 Before you get started: Freeze your ice cream bowl for at least 15 hours. After all the ingredients are combined, chill at least 1 hour before churning. This recipe is from the book that came with the attachment. Total cost if you have none of the ingredients: $29. 1. 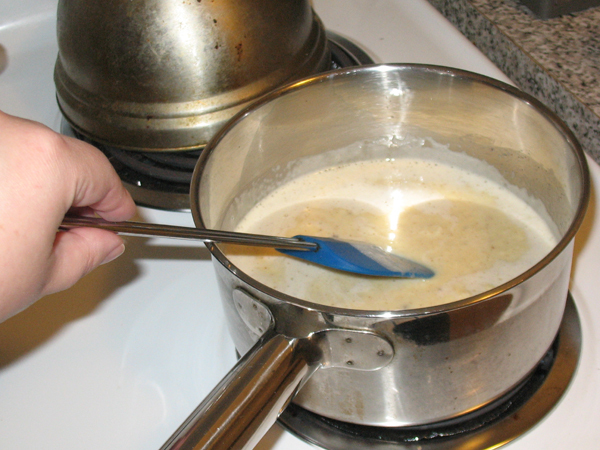 Scald the half and half in a heavy-bottomed sauce pot. 2. Combine yolks, sugar, and vanilla. 3. Use a strainer, and gradually temper in the hot half and half. Eww yuck skim. 4. Whisk in pumpkin pie spice. 5. Return mixture to stove, heat on medium-low for 10 min, stirring frequently. It’ll thicken. Don’t let it boil though. 6. Remove pot from heat. 7. 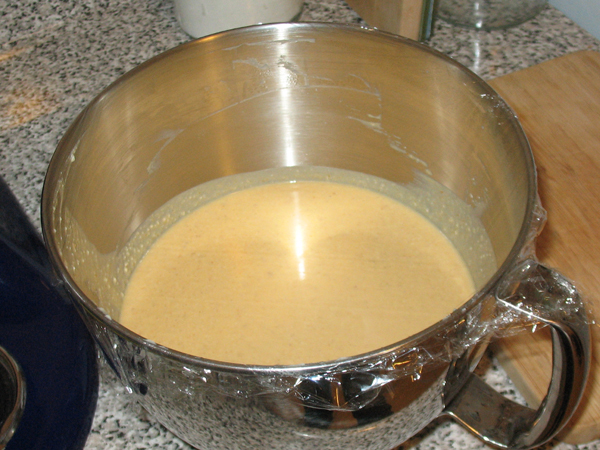 Add canned pumpkin and heavy cream to mixing bowl. 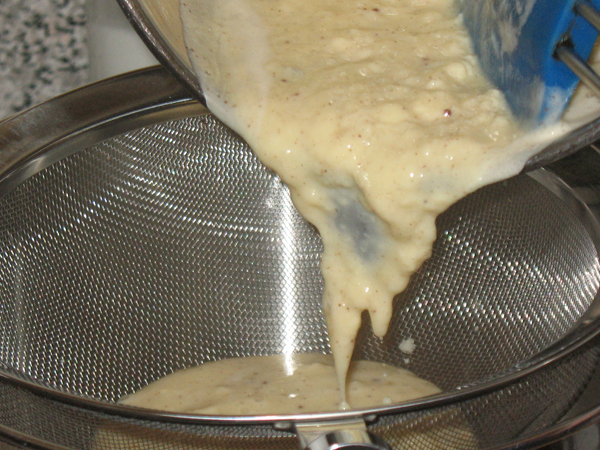 Strain in the hot mixture and whisk together. Some desserts cannot be strained enough. 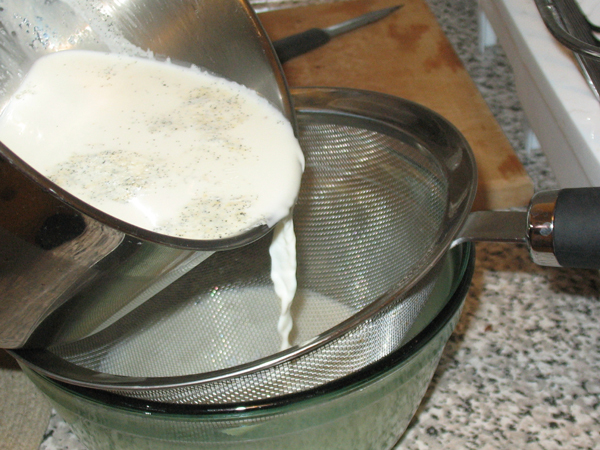 I wholeheartedly endorse straining anything that involves scalded dairy. Have no fear, it will all combine into this. 8. Chill at least one hour before churning into ice cream. 9. 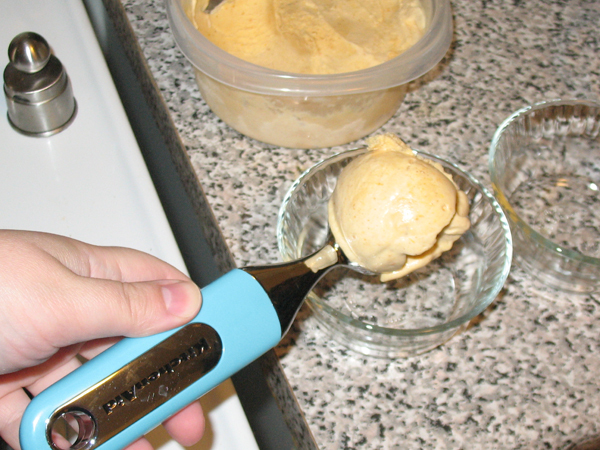 When you are ready to make ice cream, churn on speed 1 for 15-20 minutes until dasher clicks. It stayed pretty fluid until about 15 minutes, that’s when I could see it was starting to firm up. Mine took 18 minutes before the first click. I am pleased to report this time that I have figured out the frozen bowl completely, it stayed in place, and no thumbs were pinched. 10. 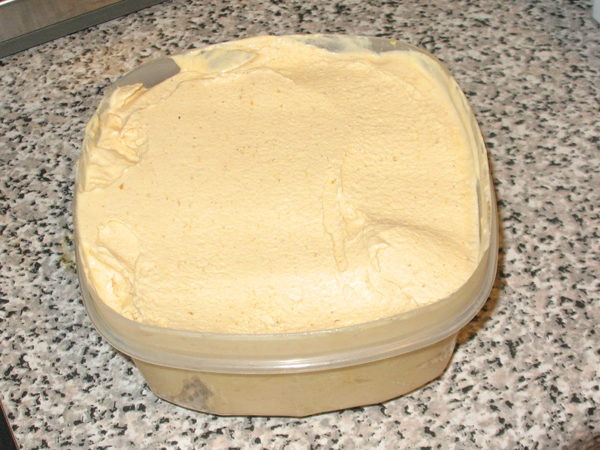 Transfer to tupperware container and freeze at least 1 hour before serving. 11. 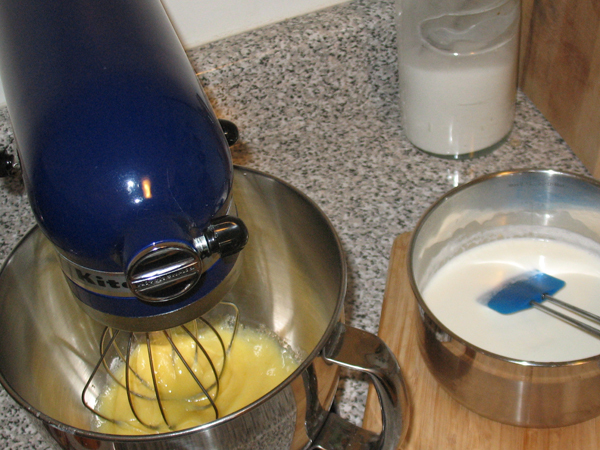 Let thaw a few minutes before scooping with beautiful blue KitchenAid scoop!! 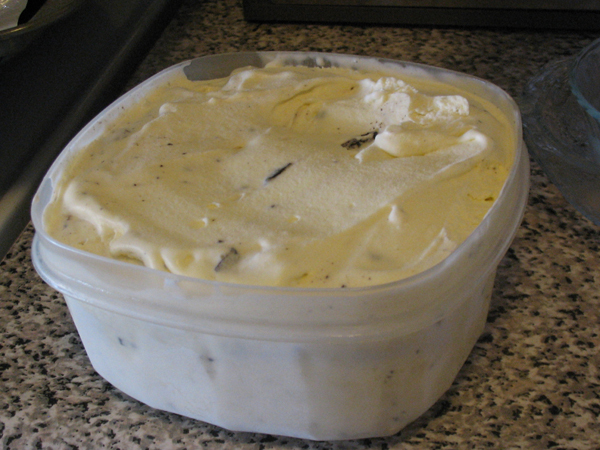 Making ice cream is so great! What shall I do with all of the frozen egg whites I have left over? It’s Thanksgiving. I have no pumpkin. But I have something better. This was a three-person enterprise made by yours truly, Boyfriend, and our friend V. This recipe is from the book that came with my ice cream maker, and I used my favourite Callebaut Belgian chocolate instead of baking squares, and added peanut butter chips. It was even more of a production than the cookies ‘n cream if you can imagine! 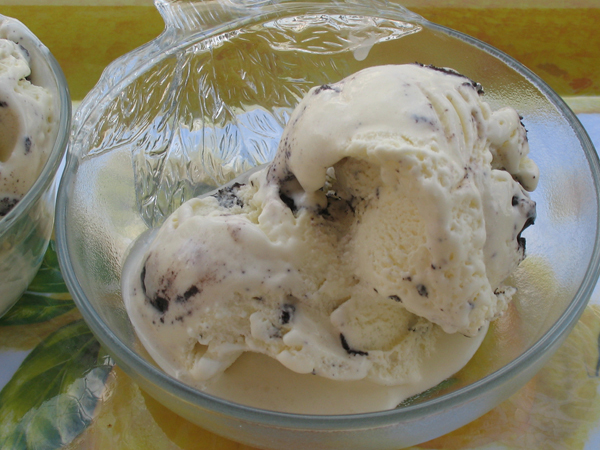 Before you get started: Your ice cream bowl needs to be frozen for at least 15 hours. 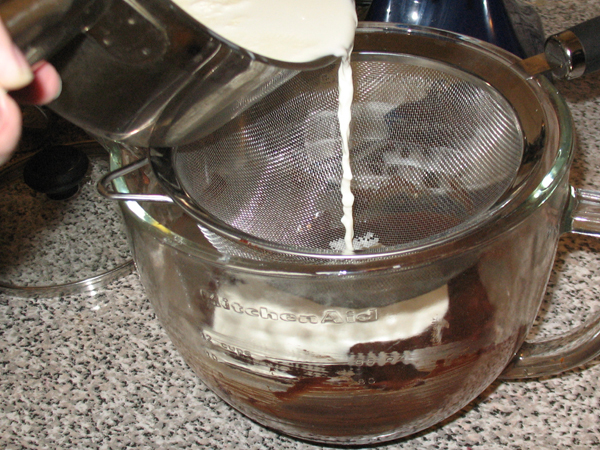 Once your start churning the ice cream, never, ever stop the mixer. 2. 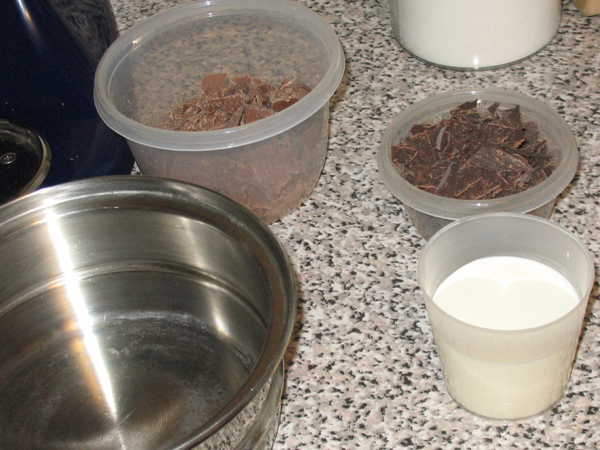 Using a double boiler on low, heat ½ C of the heavy cream, with the semi-sweet and unsweetened chocolate. 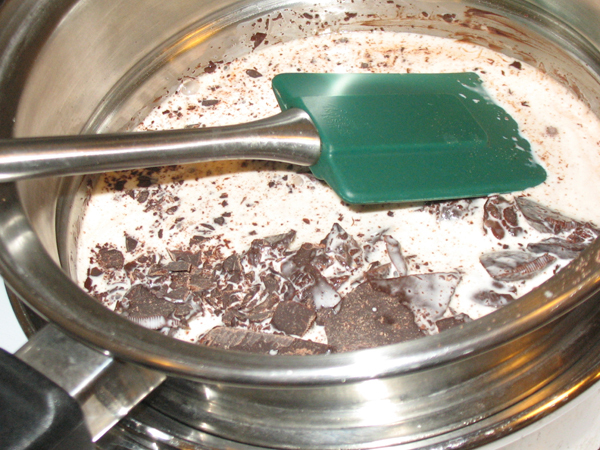 Stir often and once chocolate has melted smoothly, remove from heat. 4. 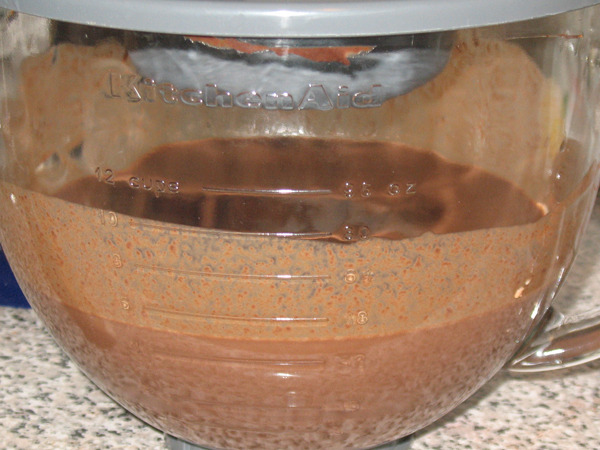 In a small bowl combine sugar and cocoa. Set aside. 5. 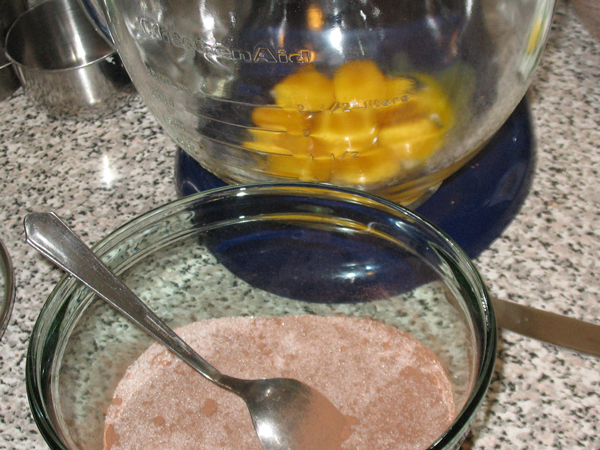 In mixer combine egg yolks and sugar/cocoa mix, beat til blended. 6. 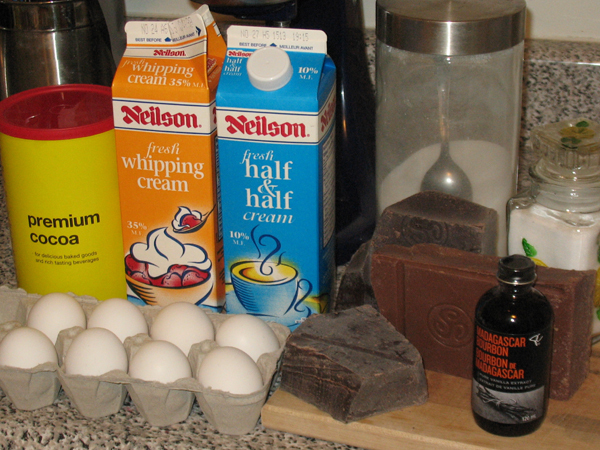 Gradually temper in the warm chocolate/cream mixture into the yolks. 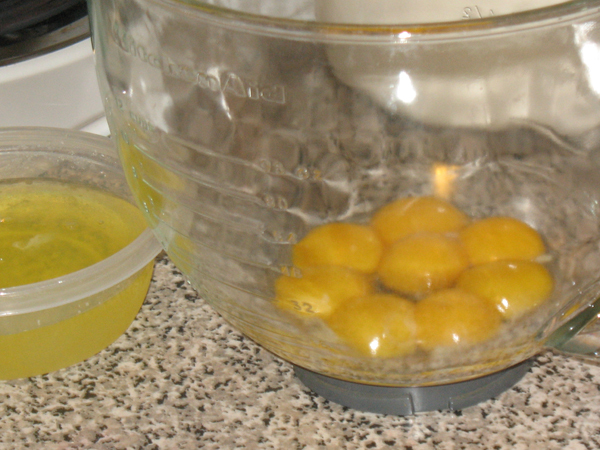 Strain the warm half and half into the yolks. 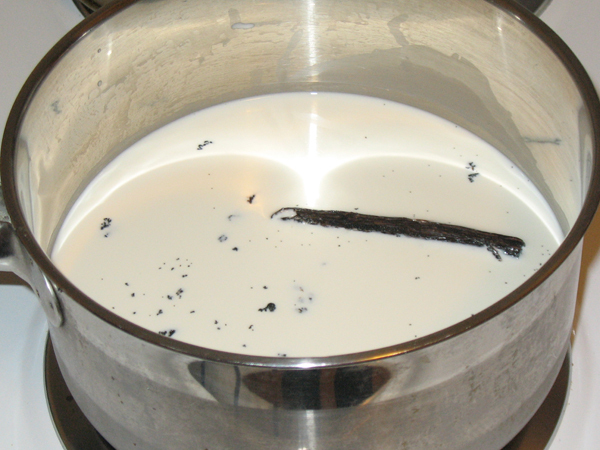 Don’t skip straining, it catches a huge skim which you don’t want in your ice cream. Or maybe you do. Ew. Blend on low until mixture is thoroughly combined. 7. Return mixture to sauce pan, heat to scalding (small bubbles form under surface but don’t let it boil). It will thicken up a bit but don’t worry. 8. 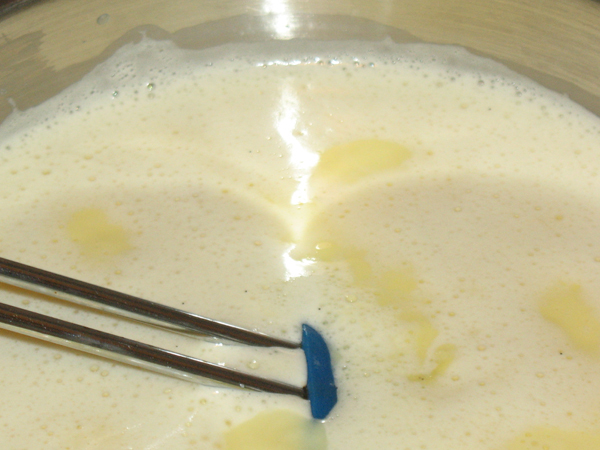 Remove from heat, and stir in the remaining 1½ C of heavy cream into the hot mixture. Cover and chill overnight. 9. 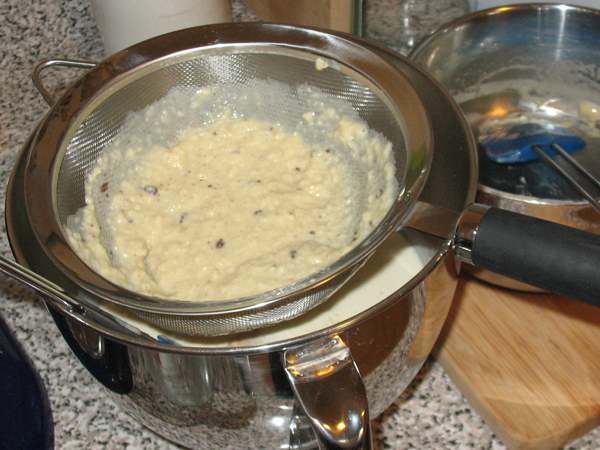 The next day, place frozen bowl in mixer and start the mixer. Pour in chilled mixture, all at once, and beat on speed 1 for 10-15 minutes. So yeah… what I said about don’t stop once you’ve started? The bowl was making a funny noise, and Boyfriend determined I put the bowl on backwards. 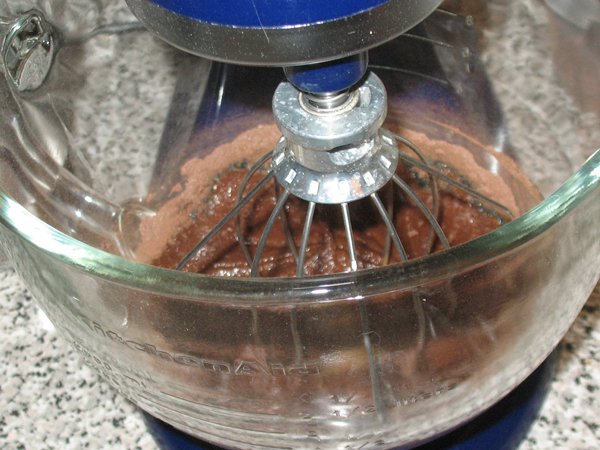 The mixer was stopped for 30 seconds to re-position the bowl. Bad idea. 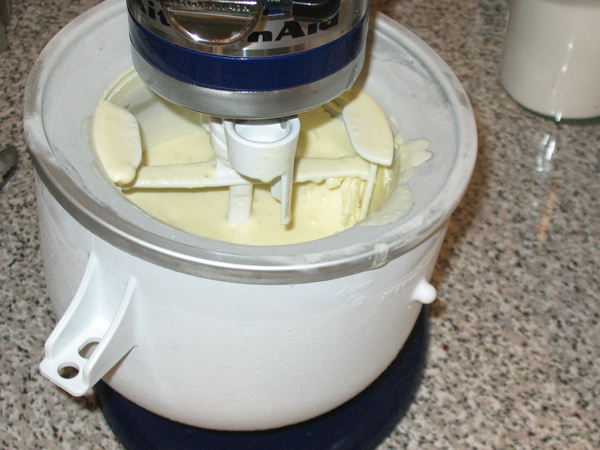 By the time the mixer started back up, the ice cream had completely frozen to the bowl and he had to churn it by hand like crazy to get it going again, while I cursed and shouted in the background. 10. When 30 seconds remain, add milk chocolate, and peanut butter chips. 11. Transfer to tupperware container and freeze at least 2 hours. 12. 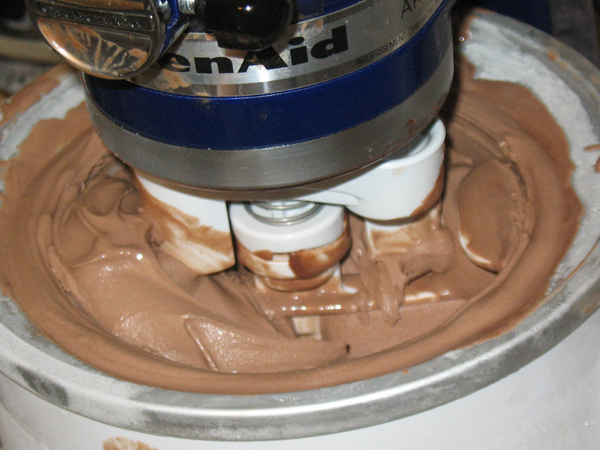 Let stand 10 minutes before scooping. Verdict: Wow, this is delicious. 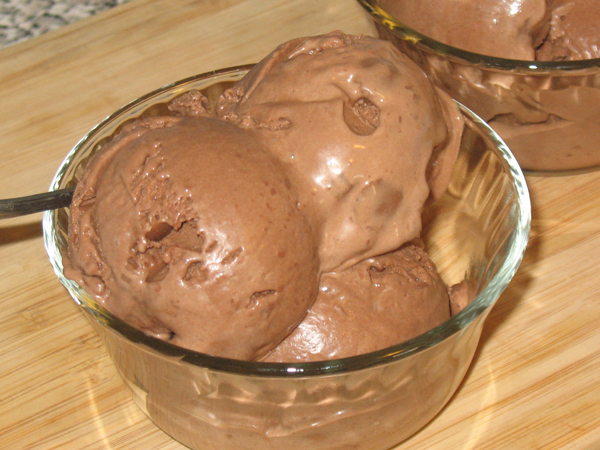 It reminds me a lot of Chocolate Supreme ice cream which I haven’t had in years. It’s very rich though. Three scoops was way too much. Can’t wait til V gets to try it. For reasons I have never been able to fathom, Boyfriend does not like ice cream. But that’s totally cool, because that means there is more for me. Behold! Homemade ice cream!! How did I make ice cream, you ask? Well! 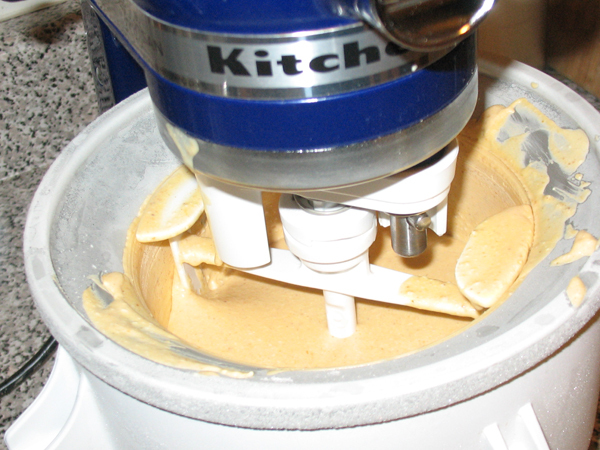 My wonderful family sent me the KitchenAid ice cream maker for my birthday. It’s an attachment designed to fit any model of a KA mixer, and I have been lusting after it for months. I can’t believe it’s finally mine!! 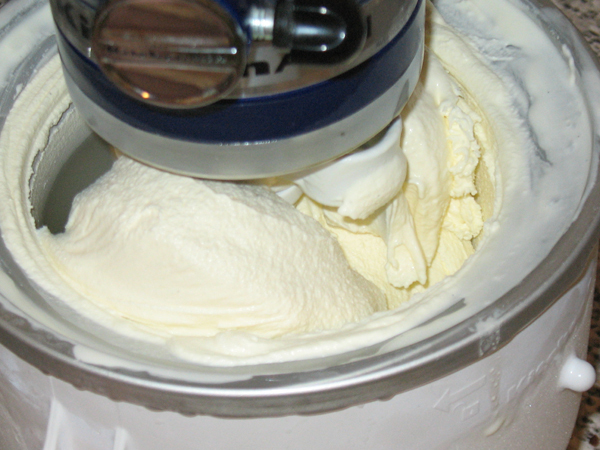 Before you get started: Making ice cream can be a two-day process. 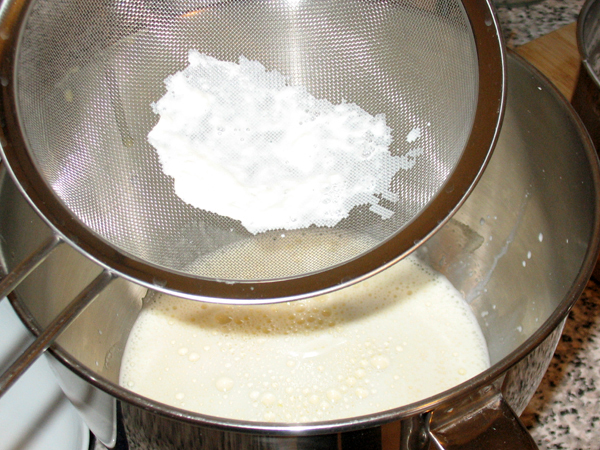 The bowl used to churn the cream needs to be frozen for at least 15 hours, and the recipe may require that you chill the mixed ingredients over night. 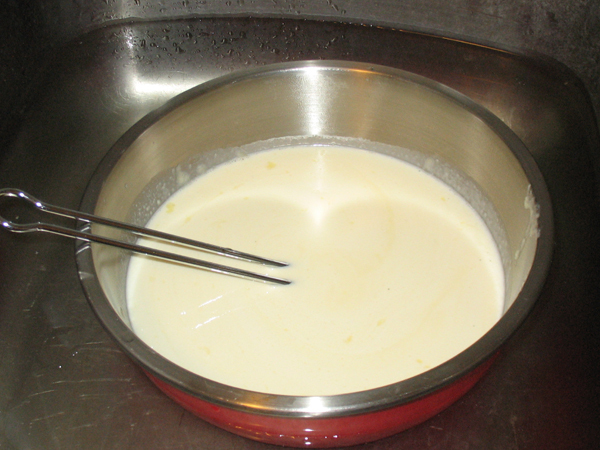 This particular recipe (from the book that comes with the attachment) is very similar to making custard. 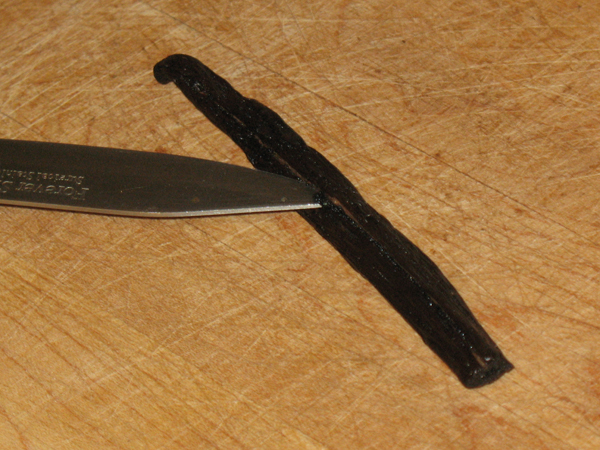 I used real vanilla bean instead of extract though. There is a helpful video here which shows how to assemble and use the attachment. 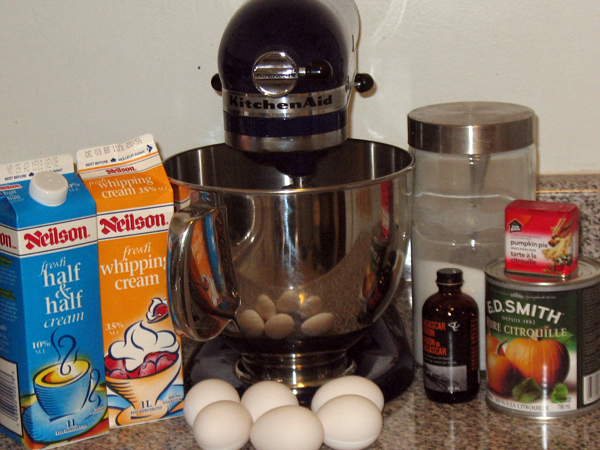 Changing the ingredients or the ratios can screw up your finished product. Yields: I don’t even know, it’s a lot. Total cost if you have none of the ingredients: $20. Cost per scoop: Can you price joy? I don’t think so. 1. In a heavy-bottomed sauce pan on medium heat, combine scraped vanilla bean and the half and half. Heat to steaming. 2. Combine egg yolks, sugar, and salt. Using speed 2 for 30 seconds is enough. 3. 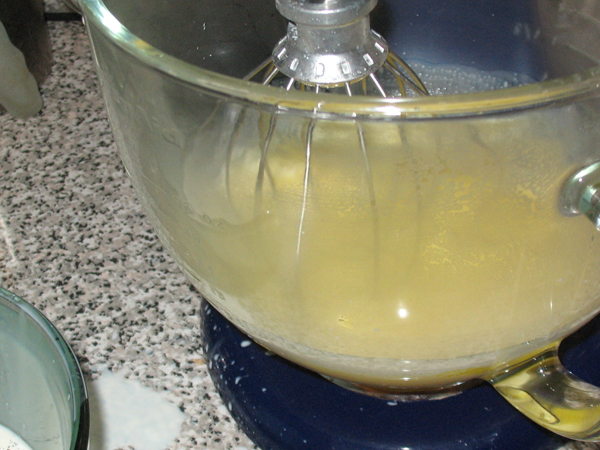 Pour hot mixture through strainer and temper into the eggs, and whisk on low to combine. 4. 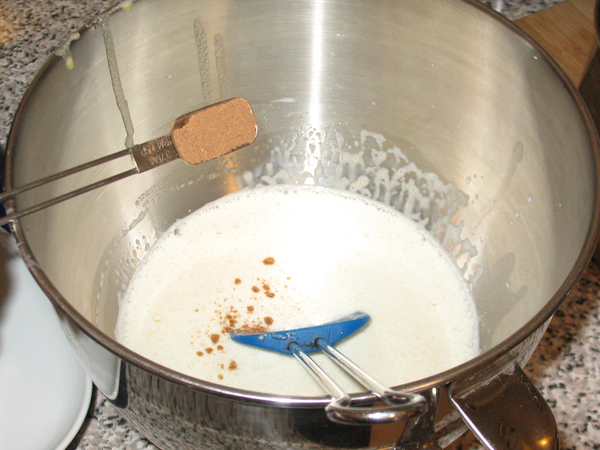 Return entire mixture to stove top, and heat to scalding. When small bubbles form at the edge it’s ready. Oops. This has heated too much. I used a different sauce pot for the second time and the bottom is too thin. Ugh I knew changing pots was a bad idea but I couldn’t be bothered to wash and dry my best pot for this type of stuff. That’ll teach me. 5. Transfer mix to a metal bowl and place into cold water bath. This will cool the temperature to prevent it from cooking. After I poured the mixture into the red bowl, I looked at bottom of the sauce pan. Uh oh. This is not good. Scorched eggy mixture. I hope my ice cream doesn’t taste like burnt eggs. That would be worse than having no ice cream at all. 6. Cover mixture and chill overnight. 7. 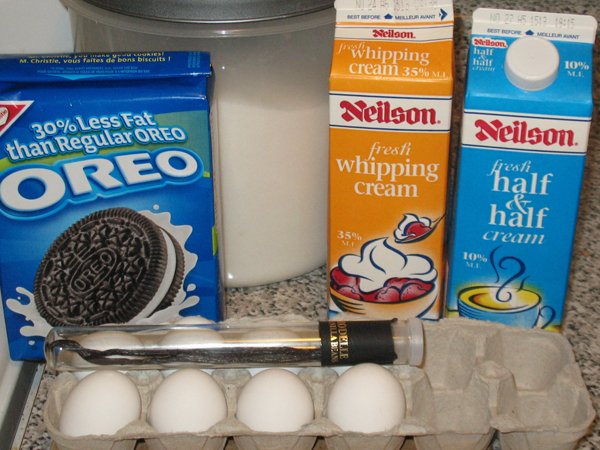 The next day, chop up Oreos and set aside. 8. Fit the drive assembly over the pin on the head of the mixer. 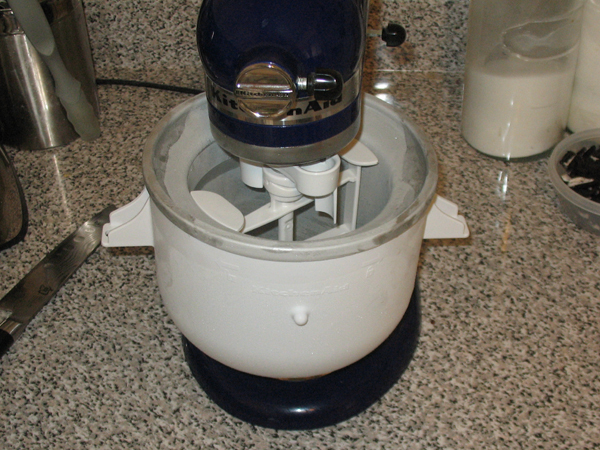 Take chilled ice cream bowl from freezer, assemble the lock on the base, and set it in the stand. 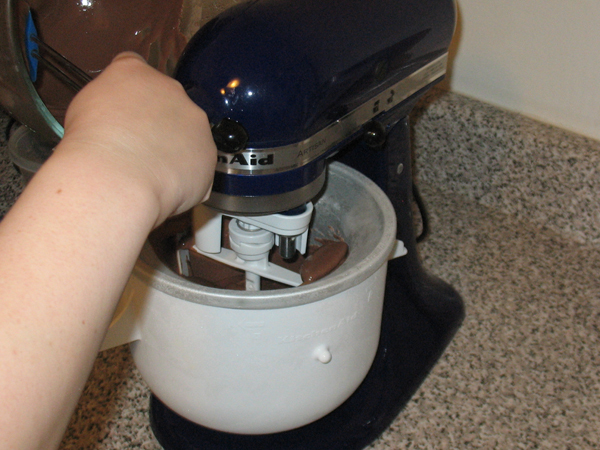 Set the dasher inside the bowl and turn mixer on lowest speed. The head should grab the dasher and turn smoothly. 9. In one pour, add the entire chilled mix to the running mixer (if the mixer is stopped your ingredients will flash freeze to the side of the bowl). 10. Churn on lowest speed for 20 minutes. It will start rising up the sides, the middle looks the right texture but the edges are soft and liquidy, I tried to scrape down the rim a few times but at this point it becomes gloriously messy. I wasn’t worried because from everything I have read about making ice cream at home, it’s normal to get soft serve and you freeze it to harden further. 11. When you have 30 seconds left, add the Oreos. 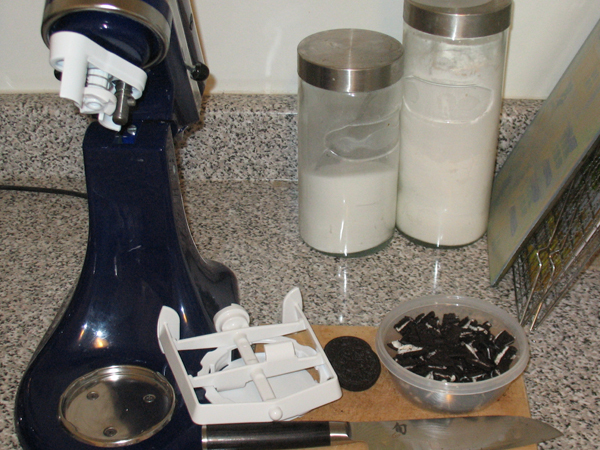 The KA recipe said to use one and half cups of chopped Oreos. That was too much, they flew out of the bowl and hit me in the face. 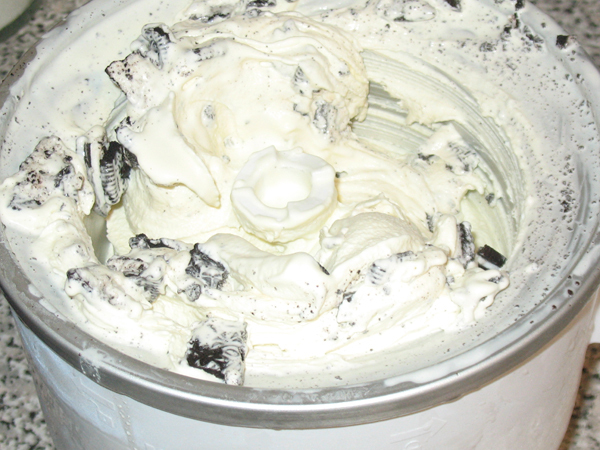 I got Oreos and ice cream everywhere. 12. It’s done! 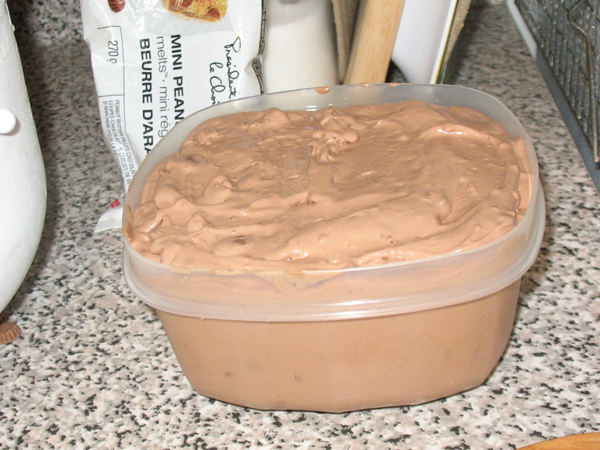 The ice cream is soft serve at this state, so transfer to a tupperware container and freeze for a few hours. 13. When you’re ready to enjoy some, let it sit 5 minutes on the counter before scooping. Verdict: Delicious!! 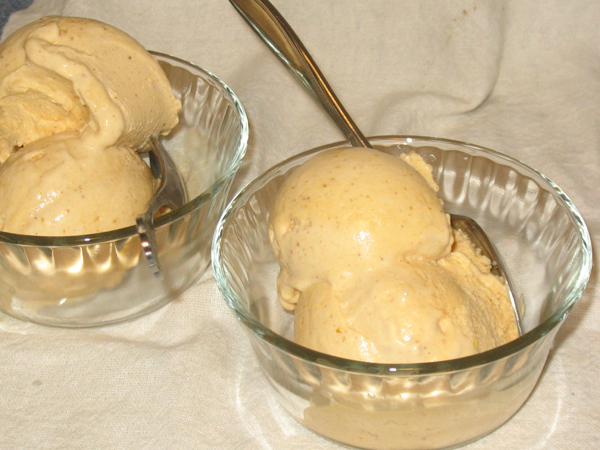 I invited a friend over and we enjoyed this lovely ice cream on my patio. I was afraid I ruined it last night when I overcooked it during the second heating phase, but it turned out wonderfully! I’m still unclear why the bowl didn’t fit into the bottom of the mixer. After I cleaned the dishes I tested this again, and the bowl sits in there correctly without the locking piece – so I’m confused. The base lock is specifically for use with the tilt-head Artisan which I have. Oh well. I still got ice cream! And it was wonderful! I will see if I can figure out how to get the bowl situated correctly next time… when I make BELGIAN CHOCOLATE PEANUT BUTTER! Gwahahahah!